Citation: Jonathan JWA, Woananu-Aggor SEE, Adatara P, et al. Variations of polychlorinated biphenyls (PCBs) levels in the bivalve Galatea paradoxa from Ada, in Ghana, during the dry and wet seasons. J Environ Chem Toxicol. 2018;2(2):48-56. Polychlorinated biphenyls (PCBs) are synthetic, aromatic organochlorine chemicals regulated by the Stockholm Convention on Persistent Organic Pollutants (POPs) due to their slow degradation, toxicity, lipophility and the ability to accumulate and biomagnify in food chains. Several studies have revealed a wide range of adverse health and developmental effects associated with exposure to PCB congeners. In order to investigate the magnitude and spatial distribution of PCBs in biota in Ghana, the bivalve Galatea paradoxa from Ada in Ghana was analyzed to determine their PCB congener concentration levels during the wet and dry seasons. The number of bivalves collected for both seasons was 180. PCB congeners were extracted using 1:1 acetone-hexane solvent mixture and the samples analyzed with a gas chromatogram; model CP 3800, equipped with electron capture detector (GC-ECD), using mixed PCBs standard of ICES 7 after clean-up. Quality assurance assessment was carried out to validate the efficiency and precision of extraction and analytical methods by the use of spiked samples and certified reference material, 1941b, from NIST, USA and analyzed alongside the samples. Total mean PCB congener levels detected ranged from 7.56 ± 1.08 µg/kg wet weight (for the dry season) to 8.26 ± 1.18 µg/kg wet weight (for the wet season); with a mean of 7.91 µg/kg wet weight. The levels of PCB congeners detected in Galatea paradoxa were very low and compared favorably well with those obtained in bivalves from other regions of the world. The compositions of PCB homologues detected followed the descending order: hepta (24.78%), tetra (22.62%), hexa (21.61%), tri (17.44%t) and penta (13.65%). Results of risk assessment conducted on the data showed that PCBs levels in Galatea paradoxa from Ada in Ghana were not high and fall within the recommended standards set by the World Health organization (WHO) and other regulatory authorities, hence may not pose any significant health risk to consumers. Polychlorinated biphenyls (PCBs), are man-made organochlorine compounds derived from a biphenyl molecule with theoretically about 209 chlorinated isomers of biphenyl. The different combinations, known as congeners, each has a definite number and pattern of chlorine substitution . Whereas less-chlorinated PCBs are colorless, tasteless, clear to pale-yellow viscous liquids, highly chlorinated mixtures are more viscous, deep yellow and soft waxy solids . Commercial production of PCBs started in 1929 but their use had been banned or severely restricted in many countries since the 1970s and 80s because of the possible risks to human health and their persistence in the environment. Owing to the resistance of PCBs to acids, bases and heat, they have been used extensively as insulating materials in electrical equipment such as transformers and capacitors, in heat transfer fluids and in lubricants. Others include uses in a wide range of products such as plasticizers, surface coatings, inks, adhesives, flame-retardants, paints and carbonless duplicating paper [1,3,4]. Concerns over the toxicity of PCBs in the environment and its classification as Persistent Organic Pollutant (POP) led to a ban on them by the United States Congress in 1979 and also by the Stockholm Convention on POPs in 2001 [4,5]. Previously, the International Research Agency on Cancer (IRAC) labeled PCBs as probable or definite human carcinogens. However, in 2013, the International Research Agency on Cancer (IARC) classified dioxin-like PCBs as human carcinogens . Indeed, several studies have established increases in malignant melanoma and rare liver cancer cases in PCB workers. Meanwhile the United States Environmental Protection Agency has declared that PCBs cause cancer in lower animals and are probable human carcinogens . Notwithstanding the prohibition of its manufacture in the United States and many other countries, PCBs are still authorized by the PCB regulatory body for use in electrical equipment, mainly as dielectric fluids (or containments in dielectric fluids) [8-10]. Today, PCBs can still be released into the environment from poorly maintained hazardous waste sites that contain PCBs, illegal or improper dumping of PCB wastes, leaks or releases from electrical transformers containing PCBs, disposal of PCB-containing consumer products into municipal or other landfills not designed to handle hazardous waste, burning some wastes in municipal and industrial incinerators . Though the production and sale of PCBs were banned since 1977, the major use of PCBs today has to do with dielectric fluid in electrical equipment servicing industries with large electrical power distribution and consumption which continue to pose potential threats to the environment in the event of releases . Currently, the main sources of PCBs in the environment are transformer oils, capacitors and other electrical equipment. Some consumer products that may contain PCBs include old fluorescent lighting fixtures, electrical devices or appliances containing PCB capacitors made before the banning of PCBs, old microscope oil, and old hydraulic oil [13-17]. The widespread commercial application of PCBs was due largely to their chemical stability such as low flammability and desirable physical properties, including electrical insulating properties. The key properties of PCBs are environmental stability, biological persistence and lipophilicity which facilitate their accumulation in the food chain. PCBs have entered the environment through use and disposal making their fate in the environment both complex and global in scale . PCBs are also known to resist oxidation and reduction in the natural environment, thereby making them very stable compounds and not degrading nor decomposing readily. Besides having a long half -life of about 8 to 15 years, they are also insoluble in water, contributing to their stability . Moreover, destruction of PCBs by chemical, thermal, and biochemical processes is highly problematic and presents the risk of generating extremely toxic dibenzodioxins and dibenzofurans through incomplete oxidation. Humans are mainly exposed to PCBs through food, and occasionally, through occupation. Some of the reported effects of PCBs in humans include chloroacne, skin discoloration, liver dysfunction, reproductive defects, dermatitis, dizziness, development toxicity and oncogenicity in exposed humans. Research has also indicated that some PCBs have the ability to alter reproductive processes in mammals . A number of research findings have established the fact that PCBs pose a major threat to humans and the environment even at very low concentrations . The main routes of PCBs into the human body is through the lungs, the gastrointestinal tract (GIT) or the skin after which they get circulated throughout the body via the bloodstream and are eventually stored in fatty tissues and other several organs such as the liver, kidneys, adrenal glands, brain, heart and skin where they can wreak havoc in diverse ways [18,19]. PCBs are known to be lethal to fishes and invertebrates and can kill these organisms in even low concentrations [20,21]. Despite the efforts of world leaders and international bodies towards PCB elimination, it is quite disturbing to know, according to recent studies that, other lesser known forms of PCBs, referred to as non-legacy PCBs , continued to be generated and released into the environment, not from intentionally created commercial products, but as unintentional by-products of manufacturing processes . The newly emerging trend on the PCB front is, therefore, a complex one: the release of non-legacy PCBs, alongside the persisting environmental presence of the usual PCBs, exacerbated by a startling revelation of how PCBs can affect human health, even at very low levels of exposure. Such an intricate development will certainly frustrate the existing efforts towards PCBs elimination. While research work has been done on the fate and transports of PCBs in environmental media, little attention has hitherto been devoted to the distribution of PCBs in biota, especially, in coastal environments in sub- Saharan Africa. In this context, our knowledge on how PCBs affect relevant physiological and behavioral characteristics of organisms that are susceptible to contamination is nascent. 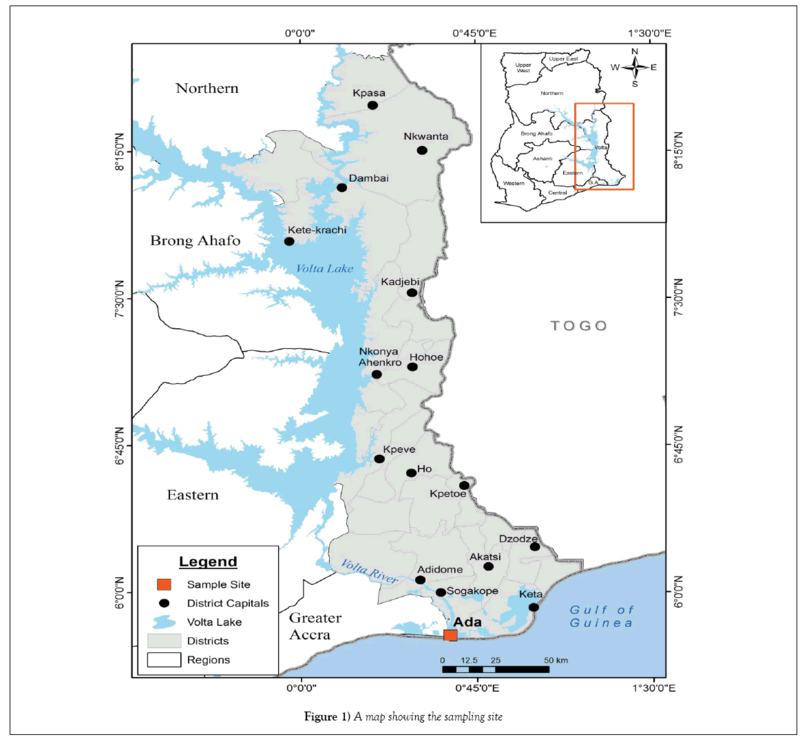 This study therefore, seeks to determine the distribution of PCBs in Galatea paradoxa from Ada in the coastal region of Ghana to ascertain whether the levels pose any significant threat to humans and the environment. The bivalves were collected from Ada in the Greater Accra Region of Ghana. Figure 1 below indicates the location of the sampling site. This location was chosen because of accessibility of the bivalves and also the fact that they serve as an important delicacy and food for the indigenous people. They also serve as important source of employment for a lot of people in the area. The samples were collected over a period of ten months; from May 2009 to March 2010. Wet season samples were collected between May 15, 2009 and November 30, 2009 while the Dry Season samples were collected between December 1, 2009 and March 30, 2010. The bivalve Galatea paradoxa (also called the Volta River Clam and locally known as adodi) was the species investigated in this study to determine their accumulation levels of polychlorinated biphenyls during the dry and wet seasons in Ghana. Galatea paradoxa are mostly fresh water bivalves which inhabit predominantly the Volta Lake or Volta River. The bivalves used in the study were of different sizes. They were collected into ice chest container and labeled. In all, about 180 bivalves were collected; 90 bivalves for each season. The procedure employed in this study for the extraction of PCBs and analysis was similar to the one adopted by Dodoo et al. . In the laboratory, Galatea paradoxa (Figure 2A) tissues were removed from their shells, blended and homogenized after which anhydrous sodium tetraoxosulphate (VI), Na2SO4, was added to the homogenized sample. Composite samples were therefore prepared. 10.0 g aliquots of the wet tissues were placed in 250 mL flat bottomed flasks. A 150.0 mL 1:1 acetone-hexane solvent mixture was added to each sample in the flask and subjected to cold maceration and wrist-shaker action for twenty-four hours (Figure 2B). The crude PCBs extracts were then collected into a 100.0 mL clean glass vial and concentrated to about 2.0 mL using a rotary evaporator. The crude extracts were subsequently transferred into a clean 12.0 mL vial for cleaning. US EPA Method 363°C clean-up procedures were used to clean the extracts. 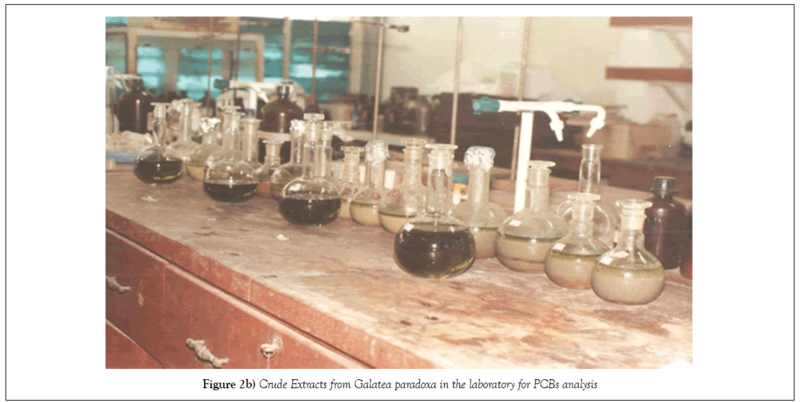 The cleaned extracts were then analyzed using a gas chromatograph equipped with electron capture detector (GC/ECD). The typical approximate reporting limit for individual PCBs is 1.0 ppm (i.e., mg/kg). PCBs recovery standards at known concentrations were first analyzed, after which the samples were also analyzed. Column temperature: 80°C (hold 2 min.) to 180°C (hold 1 min) at a rate of 25°C/min to 300°C at a rate of 5°C/min. Analytes of interest in the samples were tentatively identified and semiquantitation made. Identifications of PCB congeners were carried out by comparison of retention times, peak heights and peak patterns of the samples with those of the recovery standards. For the purpose of estimating the efficiency and precision of the extraction and analytical methods, certified reference material 1941b for PCBs from NIST, USA, was also extracted and analyzed by the GC–ECD. Having established the GC operating conditions, the same conditions were used for the analysis of standards, the QC (Quality Control) check samples, laboratory reagent blank (LRB) and samples. The quality assurance protocol adopted in this study also followed that of Dodoo et al. .
For the purpose of ascertaining the efficiency of extraction method and analytical procedures, quality assurance was undertaken as a means of validating these processes. Certified reference material1941b for PCBs from NIST, USA, was extracted and analyzed by the GC–ECD. In addition, duplicate samples were spiked with 0.2 ppm mixed PCBs standard to determine recovery and precision of extraction and analytical methods employed. Cn=Nominal concentration (peak height) of standard or spiked. C2=Measured concentration (peak height) of the second sample aliquot. The results of the precision analysis ranged from 8.9 to 9.2. The hazard index methodology described by Environment Agency (2009b, 2009c and 2009d) adopted by Dodoo et al. , was also employed for computing the HI for Galatea paradoxa in this study. TDSI=Tolerable Daily Intake of PCB =1.3 pg WHO-TEQ kg-1 bw day-1 for commercial scenario. Where, C=concentration of PCB 118; TEF having the same meaning as defined above. The results of quality assurance protocol conducted on the PCB congeners extracted from Galatea paradoxa are illustrated in Tables 1 and 2. The Certified Standard Reference Material, NIST 1941b gave recovery values ranging from 60.6% to 81.4% (Table 1). These values computed for method extraction efficiencies, within the limit of experimental errors, were quite reasonable and acceptable. Furthermore, analysis of duplicate pair samples spiked with 0.2 ppm mixed PCB standard gave recovery values ranging from 78% to 91% (Table 2). Results of precision of PCB congener analysis, expressed as relative percent (RPD%), which ranged from 8.9-9.2, were also within the framework of the standard set by the international community. For the purpose of identifying the PCB residues pattern in the samples, a comparison was made on the basis of analysis of ICES 7 PCBs (i.e., PCB 28, PCB 52, PCB 101, PCB 118, PCB 138, PBC 153 and PCB 180). Table 3 shows the results of the mean PCB congener levels in Galatea paradoxa from Ada in Ghana during the wet and dry seasons while Table 4 lists results of PCB levels in bivalves from other studies across the world. Figures 3A and 3B show the distribution pattern of PCBs congeners in Galatea paradoxa during the dry and wet seasons. The results in Table 3 illustrate the mean total PCB congener concentration levels in Galatea paradoxa from Ada in Ghana during the wet and dry seasons. It is clear from the results that total PCB congener concentrations during the dry season was 7.56 ± 0.617 μg/kg with a mean value of 1.08 μg/kg while that for the wet season was 8.28 ± 1.003 μg/kg, also with a mean value of 1.18 μg/kg. The average value for total PCBs concentration for the wet and dry seasons was 7.91 μg/kg. The mean value obtained compared favorably with those determined in bivalves from other parts of the world (Table 4). The difference between the wet and dry seasons PCB congener concentration was 0.70 μgk/kg. Slightly much higher levels of accumulation were recorded for the bivalves during the wet season than in the dry season. This observation may be explained by the fact that levels of PCBs in aquatic environments are slightly higher during the wet season mainly due to run-offs carrying PCBs from different locations into water bodies where the bivalves live and also as a result of perturbation of bottom sediments which serve as sinks for PCBs. It is also significant to note that all the 7 ICES PCB congeners were detected in the bivalves during the wet and dry seasons with varying concentrations of each of the congeners for each season. It is also important to know that levels of PCBs detected during the wet season were quite erratic whereas those detected during the dry season showed almost a normal distribution pattern, just like the average total PCBs (3C). Besides the fact that the wet season recorded a much higher total PCB Congener concentration (8.28 ± 1.003 μg/kg) than the dry season (7.56 ± 0.617 μg/kg), it is also important to emphasize that on congener per congener basis, PCB 180 recorded the highest concentration of 2.94 μg/kg compared with 0.98 μg/kg for the dry season, followed by PCB 52 with 2.15 μg/kg as against 1.42 μg/kg for the dry season. Likewise, PCB 101 and PCB 138 recorded slightly higher concentration levels during the wet season than the dry season. However, PCB 118 recorded the least concentration of 0.24 μg/kg for the wet season as against 0.36 μg/kg for the dry season, followed by PCB 153 with a mean concentration of 0.34 μg/kg for the wet season as against 1.98 μg/kg for the dry season. It is also pertinent to note that lower levels of PCB 118 were detected in Galatea paradoxa during both seasons. Figures 3A and 3B compare levels of PCB congeners during the wet and dry seasons. PCB 180<PCB 52 PCB 28<PCB 101<PCB 138<PCB 153<PCB 118; with PCB 180 and PCB 52 dominating. It is quite instructive from the results for both seasons that the bivalves accumulated fairly high levels of PCB 153, PCB 28, PCB 180 and PCB 101 and quite smaller levels of PCB 138 and PCB 118 respectively during the dry season while during the wet season they were more enriched with PCB 180, PCB 52, PCB 28, PCB 101 and PCB 138 in that order; with quite smaller levels of PCB 138 and PCB 118 respectively. It is important to indicate that none of these results is in total agreement with some earlier research findings by Dodo ort al. who reported that bivalves (i.e., oysters) from Narkwa in Ghana were more enriched with PCB 180, PCB 28 and PCB 153 than all the other congeners and also  had reported that bivalves in general, preferentially accumulate PCB congeners with 4, 5 and 6 chlorine substituents namely, PCB 52, PCB 101, PCB 118 and PCB 138. Though maximum concentration levels of PCB congeners were observed for the wet season (essentially for PCB 180 and PCB 153), yet there appeared to be no significant seasonal variation between the wet and dry season results. The seemingly greater concentrations of higher PCB congeners detected in Galatea paradoxa might be ascribed to the inability of the systems of the bivalves to metabolize these congeners efficiently that could have led to their excretion or perhaps, the higher lipid contents in their tissues which facilitated the accumulation of the higher chlorinated isomers [25,26]. Phillips  reported that PCB concentrations in biological tissues are positively correlated with the extractable lipids. In another study, Muncaster  found that PCB accumulation in the freshwater mussels L. radiata varied inversely with the body size, mainly attributable to alteration in assimilation rates. On the contrary Asokwu (1999), working on Anadara senilis did not establish any relationship between lipid content and PCB concentration . The inference that could be made from these observations is that there might be different mechanisms of accumulation pattern of pollutants as well as different metabolic capacities in aquatic biota [28-30]. These factors might be responsible for the levels of PCB congeners detected in Galatea paradoxa investigated. The clams investigated were fairly enriched with the higher chlorinated isomers (e.g. PCB 180) as well as PCB 52 and the lower chlorinated PCB 28; with intermediate distribution of the other congeners during the wet season. PCB 118<PCB 138<PCB 101<PCB 153<PCB 28 PCB 52<PCB 180. This indicates that the clams investigated were highly enriched with the highest chlorinated isomer (PCB 180), followed by the less chlorinated isomer (PCB 52), then the least chlorinated isomer (PCB 28). This finding is also in partial agreement with those of Dodoo et al. where the bivalves studied were more enriched with PCB 180, followed by PCB 28. The composition of PCB homologues in the clams was dominated by heptachlorobiphenyl, PCB 180 (24.78%); tetrachlorobiphenyl, PCB 52 (22.62%); hexachlorobiphenyls, PCB 153 and PCB 138 (21.61%), trichlorobiphenyl, PCB 28 (17.44%) and pentachlorobiphenyl, PCB 101 and PCB 118 (13.65%) homologues, respectively. Data on scholarly works concerning PCB residues in bivalves from different part of the world are shown in Table 4. In this study, the mean total PCB congener levels detected in Galatea paradoxa from Ada in Ghana ranged from 7.56 ± 0.616 μg/kg-8.26 ± 1.00 μg/kg wet weights. It is clear from Table 4 that PCB levels detected in Galatea paradoxa were quite low and compared favorably with those obtained from other regions of the world. They were lower than those from the Red Sea, Japan, Turkey, North-West Mediterranean Coast, USA, Hong Kong (China) and others. However, the values were a bit higher than those from Vietnam, Singapore, Indonesia, Cambodia and South Korea. The variability in the various regions is quite enormous, apparently in several orders of magnitude. This singular factor significantly limits analysis of intra- as well as inter-regional comparisons. Additionally, the use of different kinds of species, size differences, seasonal effects, methods of extraction and quantifications, among others, act together to make comparison of results quite difficult and challenging. Generally, the highest values are obtained from areas, often with high industrial input while the lowest concentration levels come from organisms inhabiting remote environments. This observation could be explained by the fact that PCBs are predominantly industrial-based chemical [31,32] and thus tend to be prevalent in areas where industries are concentrated. It is also of interest to know that PCB technical mixtures with specific congeners, once in the environment, essentially undergo changes (e.g. weathering) with a gradual increase in the less chlorinated congeners as a result of de-chlorination of the higher chlorinated isomers. Consequently, environmental PCB pattern cannot be compared in real terms with respect to the original pattern . Despite these findings, a randomized trial is necessary to definitively assess the value of banked virus-specific T cells for the treatment of CMV in HSCT recipients, as well as other immunocompromised patients. Toxic equivalent factor (TEF) is a value used to estimate the toxicity of a compound relative to 2,3,7,8-tetrachlorodibezo-p-dioxion (TCDD), the most toxic known chemical . TEF values, in conjunction with chemical residue data are used to evaluate toxic equivalent concentrations in different environmental samples including Galatea paradoxa. Of the PCBs analyzed in this study, only PCB 118 is a dioxin-like PCB. Thus PCB 118 TEQ concentration was determined using the equations and TEF values of World Health Organization as provided by Van den Berg et al. . In order to obtain the average PCB 118 TEQ for the bivalves, the total mean concentrations (μg/kg) of PCB 118 (Table 3) were multiplied by WHO 2005 TEF for PCB 118 (i.e., 0.00003) for both seasons and the mean value computed. Thus, the average TEQ for the bivalve Galatea paradoxa from Ada in Ghana was found to be 9.0 × 10-6 μg/kg (i.e., 0.000009 μg/kg or 0.90 ng/g). 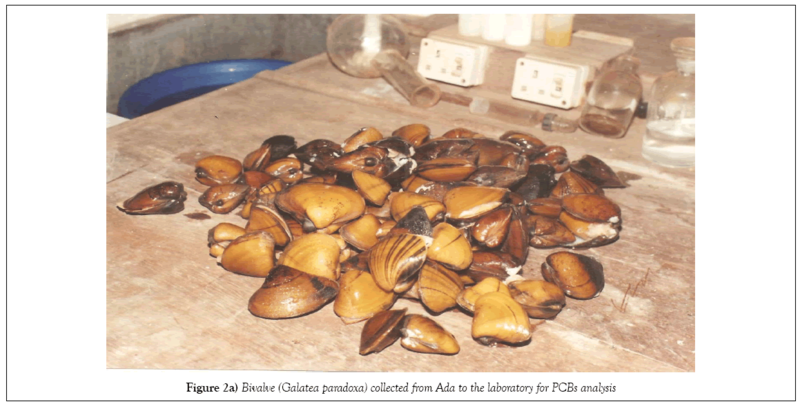 The significance of the PCB 118 TEQ value in this research is that it enabled us to evaluate the level of toxicity associated with consumable Galatea paradoxa from Ada in Ghana to ascertain whether their consumption could be harmful to human health. Hazard Index is a risk assessment protocol used to determine the degree of risk posed to humans by different levels of PCBs exposures. In this regard, an HI value of 1.0 or more indicates a significant risk to human health whereas HI values less than 1.00 indicates no significant risk (Environment Agency, 2009b). The Hazard Index methodology described by Environment Agency (2009b, 2009c and 2009d) was employed in this study for the computation of the HI value for the bivalves. TEQs are calculated values that enable the comparison of relative toxicities of dioxins and dioxin-like compounds. The TEQ value in the results was based solely on PCB 118 since it is the only dioxin-like PCB among those quantified. Thus TEQs, essentially, enable people to understand the relative toxicity of the chemical release information. ADE on the other hand, defines average daily exposure to PCBs. The mean total calculated HI value for Galatea paradoxa from Ada in Ghana was found to be 0.033. Since the value is far less than 1.0 (i.e., 0.033<<1 or HI<<1), the possibility of any health risk associated with the consumption of the Volta River Clams from Ada in Ghana is very minimal or insignificant (Environment Agency, 2009b, 2009c, 2009d). Risk assessment is the procedure by which one estimates the probability of some adverse effect, such as that of a contaminant in the environment. Environmental risk assessments are conducted to help protect human health and the environment and are often used to assist in meeting regulations such as those stipulated by regulatory bodies like World Health Organization (WHO) and many others. The complex nature of chemicals mixtures in the environment presents a challenge to risk assessment . There are many routes of exposure of toxic chemicals, such as PCBs (a member of POPs) into the human body. These include drinking water, ingestion of food substances contaminated with PCBs, indoor air (as well as outdoor air) and sediments or contaminated soils via the skin. Total POPs exposure dose estimation via soil , drinking water  and food  can be evaluated. Permissible levels of PCBs allowable into the human body are set by regulatory bodies based on exposure pathways. In recent times, a number of authorities have re-assessed and re-evaluated the potential risks of PCBs mainly based on developmental risks. In this regard, tolerable daily intake (TDI) values were essentially described for risk assessment. TDI is the amount of chemical that can be taken daily over lifetime without any anticipated adverse effects on human health. The recommendation for TDI of WHO–TEQ of the UK Committee on Toxicity of Chemicals in Food, Consumer Products and Environment (COT) is 2.0 pg WHO-TEQ/kg bw (COT, 2001). Furthermore, according to recent reports (ATSDR, 2014), the recommended standard of WHO for PCBs in food is 6.0 μg/kg. In this study, calculation of PCB 118 TEQ on Galatea paradoxa from Ada in Ghana gave a value of 9.0 × 10-6 μg/kg (i.e., 9.0 × 10-3 pg/g), a figure far lower than those recommended above by regulatory authorities. The value is also lower than the 21.0-112 pg/kg determined in some consumable bivalves by Dodoo et al. from Narkwa, Ada and Anyanui in Ghana. This indicates that consumption of the Volta River Clams from Ada in Ghana may not pose any significant risk to human health. The TEQ value was also in perfect agreement with the hazard index (HI) value of 0.033 which also indicates no significant risk to consumers of the bivalves. It is important to emphasize that all the values computed to analyze risk assessment on Galatea paradoxa from Ada in Ghana were all based on ingestion of PCB-contaminated bivalves. Therefore, based on the results obtained from this study, it can be concluded that the bivalves are not contaminated with PCBs and so are safe for human consumption. Nevertheless, owing to scanty data on levels of PCBs contamination in the study area, coupled with the fact that, other exposure pathways do exist; it is not scientifically prudent to draw a definite conclusion on health risk on consumers. It is however, important to know that PCBs with higher chlorination in fatty tissues may increase health risks, mainly because highly chlorinated PCBs tend to be retained in fatty tissues (US EPA, 1995) while those with three or fewer chlorine atoms are known to more readily undergo biological transformation (US EPA, 1992). The mean levels of PCB congeners detected in Galatea paradoxa from Ada in Ghana ranged from 7.56 ± 0.616 μg/kg wet weights (WW) for the dry season and 8.26 ± 1.003 μg/kg WW for the wet season, with seasonal average of 7.91 μg/kg. A slightly higher level of PCB congeners was detected in the bivalves during the wet season than the dry season. This observation could be attributed to run-offs carrying PCBs from different locations into water bodies where the bivalves live and also as a result of perturbation of bottom sediments which serve as sinks for PCBs. There was, however, no significant difference between the wet and dry season’s results. The overall average PCB congener levels compared favorably well with those obtained in bivalves analyzed from other regions of the world such as Mytilus galloprovincialis from Izmit Bay (Turkey), 3.0-21.0 ng/g ; Perna viridis from the Philippines, 0.4- 14 ng/g , P. viridis from Japan, 7.4-84.0 ng/g ; M. edulis from Korea, 6.0-100 ng/g , M. edulis from Denmark, 3-328 , Perna viridis from Hong Kong (China), 1.0-152.0 ng/g, M. galloprovincialis from North West Mediterranean Coast, 10.0-700.0 ng/g , Crossotrea tulipa from Ghana, 2.95-11.4 1 ng/g  and many more as illustrated in Table 4. Averagely, the compositions of the PCB homologues were dominated by heptachlorobiphenyl (24.78%)>tetrachlorobiphenyl (22.62%)>hexachlorobiphenyls, i.e., PCB 153 and PCB 138 (21.61%)>trichlorobiphenyl and pentachlorobiphenyl, i.e., PCB 101 and PCB 118 (13.65%), respectively. Furthermore, risk assessment was conducted on Galatea paradoxa analyzed in the study using the PCB 118 TEQ (WHO-TEQ) and hazard index (HI) risk management protocol. The results indicated that the calculated PCB 118 TEQ of 9.0 × 10-3 pg/g bw determined falls reasonably well within the recommended tolerable daily intake (TDI) of WHO–TEQ of the UK Committee on Toxicity of Chemicals in Food, Consumer Products and Environment (COT) of 2.0 pg WHO-TEQ/kg bw as well as the recommended standard of 6.0 μg/kg (or 6.0 ng/g) set by the World Health Organization, WHO . This indicates that Galatea paradoxa from Ada in Ghana are not unduly contaminated with PCBs and so may not pose any significant health risk to consumers. In addition, the HI risk assessment protocol gave a value of 0.033 (i.e., HI<<1) also in support of the fact that Galatea paradoxa from Ada in Ghana are safe for consumption. This study is very relevant since it provides additional information and data on the scope and distribution of PCBs in biota in the Ghanaian environment. Moreover, it will also contribute significantly to the global inventory of PCBs and pave the way for adequate risk assessment. In the local front, it will go a long way in augmenting the efforts of Ghana’s Environmental Protection Agency (EPA) toward PCB elimination in accordance with the Stockholm Convention. My sincere thanks go to my family, especially, my loving wife for her support and encouragement all these years. I also thank Prof. DK Essumang, Rev. Prof. DK Dodoo and Dr. JK Bentum of Department of Chemistry, University of Cape Coast for their guidance and direction throughout my MPhil Thesis out of which I have been able to extract this paper for publication. I further thank Mr. Paul Osei-Fosu of Ghana Standard Authority for running the samples and also Mr. Afful, a technician at the Chemistry Department of Ghana Atomic Energy Commission (GAEC) for linking me up with Ghana Standards Authority. Wong CS, Capel PD, Nowell LH. Organochlorine pesticides and PCBs in stream sediment and aquatic biota. Initial results from the National water-quality assessment program. 2000;88. Grossman E. Non-legacy PCBs: Pigment manufacturing by-products get a second look. Environ Health Perspect (EHP). 2016. Rudel RA, Seryak LM, Brody JG. PCB-containing wood floor finish is a likely source of elevated PCBs in resident’s blood, household air and dust: A case study of exposure. Environ Health. 2008;7(2). Green facts: Scientific facts on polychlorinated biphenyls. Source document: IPCS-WHO. 2006. Porta M, Zumeta E. Implementing the Stockholm treaty on persistent organic pollutants. Occup Environ Med. 2002;10(59):651-2. Lauby-Secretan B, Loomis D, Grosse Y, et al. On behalf of the International agency for research on cancer monograph working group. Carcinogenicity of polychlorinated biphenyls and polybrominated biphenyls. Lancet Oncol. 2013;14:287-8. Van den Berg M, Birnbaum L, Albertus B, et al. Toxic equivalency factor (TEFs) for PCBs, PCDDs, PCDFs for humans and for wildlife. Environ Health Perspect. 2005;106:775-92. Centeno C. Persistent organic pollutants (POPs). Contaminated sites assessment in Ghana using the UNIDO toolkit, Bratislava 2010. Otchere FA. Organochlorines (PCBs and pesticides) in the bivalves Anadara (Senilis) senilis, Crassostrea tulipa and Perna perna from the lagoons of Ghana. Sci Total Environ. 2005;348:102-14. Nakata H, Kawazoe M, Arizono K, et al. Organochlorine pesticides and polychlorinated biphenyl residues in foodstuffs and human tissues from China: Status of contamination, historical trend and human dietary exposure. Arch Environ Contam Toxicol. 2002;43:473-80. US EPA. Office of science and technology, standards and applied science division. National study of chemical residues in Fish. 1992;2. Bench DW. PCBs, mining and water pollution, USA environmental protection agency. 2003;80202-2466. US EPA. Polychlorinated biphenyls: Learn more about polychlorinated biphenyls (PCBs). 2016. McGraw-Hill Encyclopedia of science and technology. McGraw-Hill Book Company. 1987;14:127-8. Khim JS, Villeneuve DL, Kannan K, et al. Instrumental and bioanalytical measures of persistent organochlorines in blue mussel (Mytilus edilus) from Korean coastal waters. Arch Environ Contam Toxicol. 2000;39:360-8. Baars AJ, Bakkera MI, Baumanna RA, et al. Dioxins, dioxin-like PCBs and non-dioxin-like PCBs in foodstuffs: Occurrence and dietary intake in The Netherlands. Toxicol Lett. 2004;151(1):51-61. Muncaster BW, Hebert PDN, Lazar R. Biological and physical factors affecting the body burden of organic contaminants in freshwater mussels. Arch Environ Contam Toxicol. 1990;19:25-34. World Federation of Public Health Associations. Polychlorinated biphenyls. 2000. Monirith I, Ueno D, Tkahashi S, et al. Asia-Pacific mussel watch: Monitoring contamination of persistent organochlorine compounds in coastal waters of Asian countries. Mar Pollut Bull. 2003;46:281-300. Joiris CR, Tapia G, Holsbeek L. Increase of organochlorines and mercury levels in common guillemots Uria algas during winter in the southern North Sea. Mar Pollut Bull. Dodoo DK, Essumang DK, Jonathan JWA. Accumulation profile and seasonal variations of polychlorinated biphenyls (PCBs) in bivalves Crassostrea tulipa (oysters) and Anadara senilis (mussels) at three different aquatic habitats in two seasons in Ghana. Ecotoxicol Environ Saf 2013;88:26-34. The New Encyclopedia Britannica. UNEP Chemicals (1999). Guidelines for the Identification of PCBs and Materials Containing PCBs (PDF). United Nations Environment Programme. 2007;9:11-7. Boon JP, Van der Meer J, Allchin CR, et al. Concentration dependent changes of PCB patterns in fish eating mammals: Structural evidence for induction of cytochrome P450. Arch Environ Contam Toxicol. 1997;33,298-311. Weis JS, Monosson E. PCBs in: Encyclopedia of Earth. 2012. US EPA. Guidance for assessing chemical contaminant data for use in fish advisories. Fish Sampling and Analysis. 1995;1. Wong CS, Capel PD, Nowell LH. Organochlorine pesticides and PCBs in stream sediment and aquatic biota - Initial results from the National water-quality assessment program. 2000;88. Hu D, Hornbuckle KC. Inadvertent polychlorinated biphenyls in commercial paint pigments. Environ Sci Technol. 2009;44(8):2822-7. Li Z, Jennings A. Worldwide regulations of standard values of pesticides for human health risk control: A review. Int J Environ. 2017;14(7). Sericano JL, Wade TL, Brookes JM. Accumulation and depuration of organic contaminants by the American oyster (Crassostrea virginica). Sci Total Environ. 1996;179:149-60. Azokwu MI. (1999). Ecotoxicology of Stable Pollutants in the Bivalve Anadara (S.) Thesis, Free University of Brussels, (VUB). Granby K, Spliid NH. Hydrocarbons and organochlorines in common mussels from the Kattegat and the Belts andtheir relation to condition indices. Mar. Pollut. Bull. 1995;30:74-82. Tanabe S, Purudente MS, Kan-atirekalp S et al. watch: marine pollution monitoring of butyltins and organochlorides incoastal waters of Thailand, Philippines and India. Ocean Coast. Manage. 2000;43:819– 839. Telli-Karakoc F, Tolun L, Henkelmann B et al. Polycyclic aromatic hydrocarbons (PAH) and polychlorinated biphenyls (PCB) distribution in the bay of Marmara Sea: Izmit bay. Environ. Pollut. 2002;119:383– 397. Tolun L, Okay OS, Gaines AF et al. The pollution status and toxicity of surface sediments in Izmit Bay (Marmara Sea), Turkey. Environ. Int. 2001;26:163–168. Khaled A, Nemr AE, Said TO et al. Polychlorinated biphenyls and chlorinated pesticides in mussels from the Egyptian Red Sea Coast. Chemosphere. 2004;54:1407–1412. Burt JS, Ebell GF. Organic pollutants in mussels and sediments of coastal waters of Perth, Western Australia. Mar. Pollut. Bull. 1995;30:723–732. Liu JH, Kueh CSW. Biomonitoring of heavy metals and trace organics using the intertidal mussel Perna viridis in Hong Kong coastal waters. Mar. Pollut. Bull. 2005;51:857–875.